The Irish anti-austerity movement is changing what's politically possible on the island. Throughout the past fall and again in December, people took to the streets in numbers rarely seen in Ireland. On December 9, organizers said there were 100,000 people marching in Dublin, 2 percent of the Irish Republic’s population of 4.5 million. The impetus for the biggest protest movement in a generation — and perhaps since independence from Britain — is the Irish government’s plan to institute a new tax on water, ranging from €176 to as much as €500, depending on the size of the household. The demonstrations are creating the conditions for a seismic shift in Irish politics. Paradigms once entrenched are suddenly open to contest. The center-right government is finally feeling some pressure, and the Left appears emboldened. Of all the PIIGS countries — Portugal, Ireland, Italy, Greece, and Spain, those suffering under the current unholy trinity of the European Union (EU)-International Monetary Fund (IMF)-European Central Bank (ECB) and from the virtual suspension of democracy over the past six years — it has been Ireland that has failed to mount a challenge to austerity, until now. The demographics at the protests cut across a large swath of Irish society. The university students in their late teens now were only adolescents when the crash happened and austerity began. But older generations, struggling to pay their bills and having seen their children emigrate for lack of work, are on board too. At the forefront of the movement has been the Right2Water campaign, comprised of labor unions, Sinn Féin, and smaller left parties. The Services, Industrial, Professional and Technical Union (SIPTU), Ireland’s largest union, initially declined to back the demonstrations, but then joined after the massive protests in November. Much of the anger over the charges was triggered by revelations of the exorbitant amount spent setting up Irish Water, the semi-state utility that levies the fees. As more of the chicanery surrounding Irish Water’s establishment became clear, the years of silent frustration over austerity finally spilled out. A fourteen-week lockout at a Dublin recycling plant further heightened the tension, culminating in the massive demonstrations seen this fall. During the 1990s, Ireland was nicknamed the “Celtic Tiger” and held up as a paragon of what neoliberal economic structures could do for a country’s growth rate. Ireland’s booming property and development sectors were the envy of Europe. And then it all fell apart. The backstory of the boom’s eventual bust is familiar. Astronomical economic expansion came on the strength of reckless bank lending in home mortgages and then in property speculation, using capital borrowed on the international market. The story of the crash is familiar as well. Irish banks were over-leveraged, and when the 2008 collapse of Lehman Brothers rippled to European debt markets and European banks wanted their money back, Irish banks had no money with which to pay. What distinguished the Irish crisis from the Spanish or Greek crisis was the size of the debt relative to the size of the economy, and the way in which the Irish state handled those obligations. The state guaranteed all of the bad debt without so much as a parliamentary vote or cabinet meeting, transforming a private banking crisis into a public sovereign debt crisis. For comparison, the debt assumed by the $700 billion Troubled Asset Relief Program (TARP) worked out to just over $2,000 per US citizen. When the Irish government created the National Asset Management Agency to buy up roughly $101 billion of Irish banks’ bad debt, it amounted to almost $22,000 per citizen. If the number is scaled to the size of the workforce in Ireland, the socialization of this private debt is even more staggering. When the Irish state could not come close to covering the debts of the banks and property speculators, representatives from the IMF, EU, and ECB came to Dublin for a good old-fashioned structural adjustment: minimum-wage cuts, public-spending slashes, and public-sector layoffs. From British colony to Vegas-style cesspool of capital, then back to indentured servitude under European capital in less than a century. Yet the Irish people dutifully took their lumps. There are a few competing explanations about why. Some have pointed out that economic failure, outward emigration, and high unemployment are simply the status quo in Ireland, dating back to at least the famine. Others say all the young people moved to Australia and North America, precluding any upsurge. In any case, the Irish were told to behave, and they did. That docility vanished this fall with the enormous mobilizations against water charges. The protests seem to have caught the governing parties off guard. Leo Varadkar, the right-wing health minister said last month it “really bothers” him that people are protesting the fees charges. There are bigger issues at stake, he maintained. In November, Joan Burton, the Labour Tánaiste (deputy prime minister), was trapped in her car during a water protest in southwest Dublin for several hours. To Burton, the protesters resembled fascists — a curious comment from someone in coalition with a party that itself grew out of Ireland’s brief flirtation with fascism. Some of the confusion stems from the fact that politicians insist Ireland is “on the mend.” Unemployment, which peaked at 15 percent in early 2012, is now down to 10.7 percent. A slew of December polls had them all the more perplexed. Labour sat at 5 percent, while independents and smaller parties totaled 30 percent. The other big winner has been Sinn Féin, the party once known as the “political wing of the Irish Republican Army.” The party’s rise over the last few years in the Irish Republic has been nothing short of meteoric. In the 2011 parliamentary elections, Sinn Féin jumped from 4 to 14 seats in the 166-seat Dáil, and current polls put them at either the most or second-most popular party in the country. (The 2011 election also saw Fianna Fáil, the center-right party that has held power for most of the Irish Republic’s history, thrown out in favor of Fine Gael, also center-right, and Labour.) Sinn Féin shares power in Northern Ireland, but has only contested elections in the South since the 1980s; it previously refused to recognize the parliament of a partitioned Irish Republic, which it viewed as illegitimate. While some in the South still associate Sinn Féin with the violence of the Troubles, it is Sinn Fein’s economic platform rather than its struggle for a united Ireland that is now capturing attention. Of the four major parties, it is the only one that is not committed to implementing the troika’s austerity agenda. The party’s 2015 “alternative budget” calls for reinvestment in social housing, health care, education, and other key sectors. However, it was only after the mass protests against water charges — as well as an October parliamentary by-election in which the party lost a seat to the further left Anti-Austerity Alliance candidate — that the Sinn Féin came out against the fees. Now firmly on board, party president Gerry Adams spoke at the December protest to big cheers. The next Irish election will take place this year or next, and a Sinn Féin victory would radically alter the political landscape. Even the polling showing the party is the Irish Republic’s most popular would have been unthinkable ten years ago. Since independence, Irish politics has been based on a clientelist system in which party elders make decisions almost entirely independent of social pressures. Fianna Fáil and Fine Gael work in this way. In the South, the historic political divide hasn’t sprung from ideology, but the Irish Civil War: Fianna Fail opposed the treaty that split the island and ended the war, while Fine Gael supported it. Both are effectively center-right parties that occasionally make gestures toward economic populism. Bereft of a proper institutional left, Ireland has been long been stuck with these two parties. So long as local constituencies got concessions and favors from Dublin, the order was maintained. (“My father voted for his father, and my son will vote for his son.”) The rise of Sinn Féin would mean that tradition is starting to come apart in the South, and a real left could emerge. While limited to two center-right parties in government, the idea of an Irish worker’s republic, “from the plough to the stars,” is an old one. Before Lenin of course, there was James Connolly and his Citizen Army. The water protests in Dublin have been on O’Connell Street, within sight of a statue of the radical labor leader “Big Jim” Larkin. During the nineteenth century, the Irish countryside saw a pair of bloody uprisings against absentee landlordism. More recently, the Irish left coalesced around opposition to the US military’s use of Shannon Airport as a staging point for the wars in Iraq and Afghanistan, as well as for CIA rendition flights. An array of organizations to the left of Sinn Féin are also active. While small, they function as Sinn Féin’s anchor, forcing the party to take a firm stand against austerity and water fees. For example, the Anti-Austerity Alliance’s Paul Murphy — who defeated Sinn Féin’s candidate in the 2014 by-election — has been a strong voice in the Dáil and on the street against water charges. Northern Ireland is a different story altogether. In the six counties of the Northern Irish state, Sinn Féin already sits in government. As a provision of the 1998 Good Friday Agreement, the largest Catholic party must share government with the largest Protestant party. Sinn Féin thus sits in a mandated coalition government with the hard-right Democratic Unionist Party; the parties’ two leaders act as co-executives. In the days leading up to Christmas, the two parties (both governing a statelet of the United Kingdom) agreed to a local — if softened — version of David Cameron’s austerity measures. In Dublin, Sinn Féin rails against cuts and layoffs. In Belfast, it implements them. The party once linked to the group that nearly killed Margaret Thatcher is now implementing the austerity policies that are Thatcher’s chief legacy. This is the first of two major problems faced by Sinn Féin, if it hopes to radically shift Irish politics toward the left. It would be naive to think the contradictions between the northern and southern versions of the party would not present some friction if the southern version became a serious player in state politics. The second problem is that the same two men — Adams in the South, Martin McGuinness in the North — have been in charge of the party for over thirty years. Both are former IRA fighters who were instrumental in leading the guerrilla group away from armed struggle. It is unclear how palatable voters in the South find Sinn Féin’s historic association with the IRA. It hasn’t seemed to matter much during the past year of protest around water charges. (They are much better known in the North.) Sinead O’Connor recently applied to join the party, and at the same time called on the current leadership to step down. Whether Sinn Féin can become the party vehicle for fighting austerity depends on whether it can confront its past — no easy task in a country with a much-hated border that also divides the party. Will the southern version have to move to the right to join the northern version? Or the other way around? Is the past pulling the party backward? What about the question of Irish unity? For a lot of people this is still a very important goal, and one on which they don’t see any progress. In any case, Sinn Féin is set to play a large role in the island’s politics over the next few years. Ireland is watching the upcoming Greek election closely. A Syriza victory in Greece would be a boon for the emerging Irish anti-austerity left in general, and may bolster forces to the left of Sinn Féin. Such parties and movements will continue to play an important role in preventing a rightward drift. 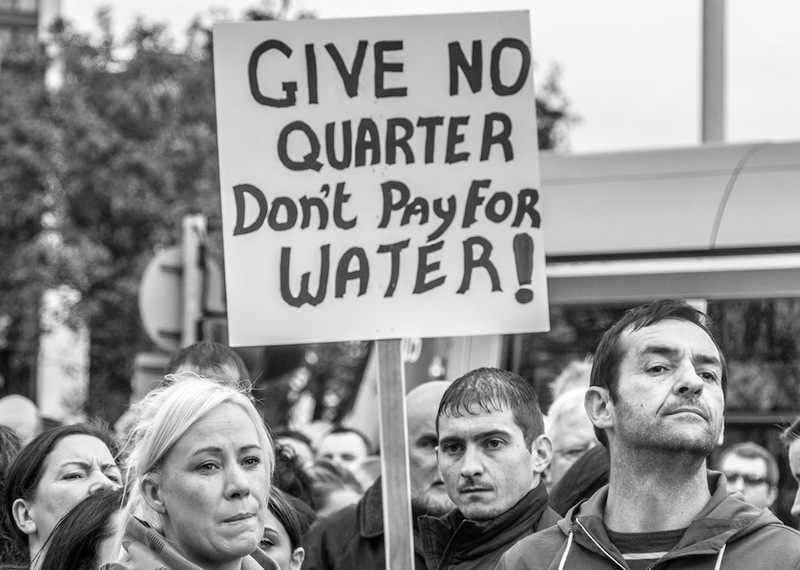 At the end of the month, there is set to be another large anti-water charge protest. Water meters are still being disabled. Perhaps, cribbing from the British, mass non-payment is the next step. But fighting austerity and water charges shouldn’t be viewed as the terminus. Going forward the main task will be to build an Irish left capable of taking on not just water fees, but capitalism itself. Michael Lee-Murphy is a freelance reporter and writer. The Irish anti-austerity movement is changing what’s politically possible on the island.